I'm having a weird issue with Sega Genesis games. Firstly, the scrolling is "hitchy," which is to say that when running (in the Sonic the Hedgehog games for example) every few frames seems to catch ever so slightly. 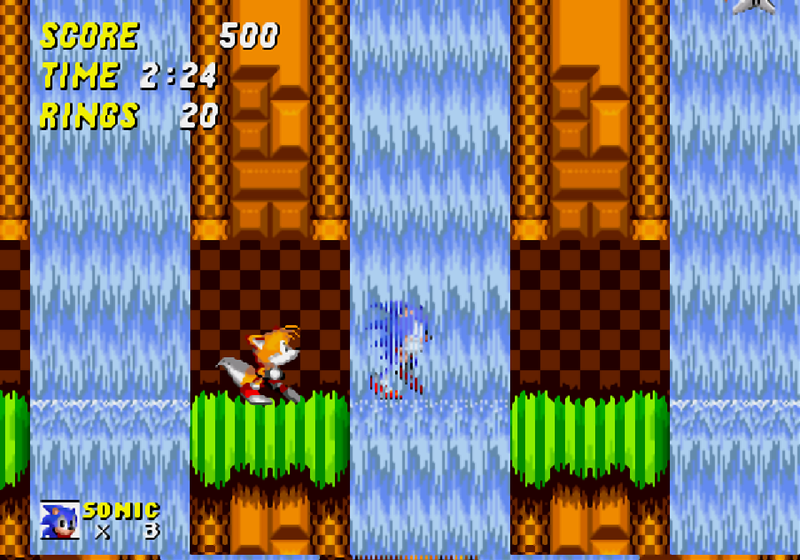 Second, in Sonic 2, the green grass in the first level has odd graphical glitches when you jump sometimes. This is especially noticable in the section early on when you're running through waterfalls (see screenshot). The odd thing is that this is completely independent of emulator cores or shaders, and when I played the game in Retroarch using the same core on my Shield Android TV, there was no issue. I've fiddled with video settings in the Retroarch menu with no success. This doesn't seem to happen in other systems either, just Sega Genesis. I tried capturing the graphical glitch in a screenshot, but when I pause the game it disappears and screenshots won't catch it either. EDIT: Apparently this happens when you change the emulated resolution to 1080i from 720p (default). That's too bad. It still looks good though and now the issues are gone.